Use this Fall Cleaning Check List to clean up your vegetable garden and prepare for winter. You can download and print a copy, too. These few simple steps at season’s end don’t take much time now, but can help you save a lot of time in the spring. A bit of effort now gives you a healthier tomato crop and vegetable garden, too. Plus, you’ll have the tidiest garden area on the block. You don’t want to yank your tomato plants out of the ground if they are still producing. On the other hand, you want to make sure you have the chance to clear up the garden before rains and snow have their say. Here’s a tip: know the first frost date for your local area. Plan garden clean up into your schedule accordingly and then watch the weather closely. Tomatoes cannot withstand frost, so once Jack pays a visit to your garden, your plants will be finished for this season. Mark where you grew different crops this year so you can rotate them next season. Record notes from this season in a garden journal or notebook. Discard ties and remove remaining vines and branches from supports. Pull supports from the ground, scrape off excess soil, and clean them with a disinfectant solution. Bundle supports together and store them for winter. Clean and disinfect garden tools so they’re ready for next season. Store garden tools for next season. Gather dropped or mummified fruit and garden debris. Use a garden rake to clear the garden surface. Burn or discard diseased debris. Add compost or other organic material to the garden. Use a tiller or spade to break and cultivate the soil so winter rains can to be absorbed into the garden. Cover garden with a layer of leaves, straw, or mulch to keep even soil temperature and to protect next season’s soil. 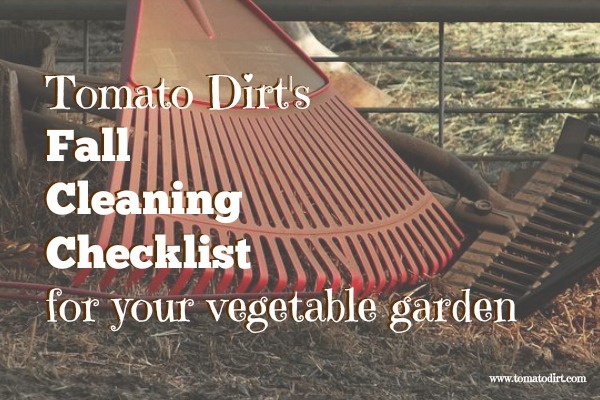 Type in your email address and we'll send you a link where you can download your own copy of Tomato Dirt's Fall Cleaning Checklist.